Gastric carcinoma is the most common cancer in the world after lung cancer and is a major cause of mortality and morbidity. Though a marked reduction has been observed in the incidence of gastric carcinoma in North America and Western Europe in the last 50 years, 5-year survival rates are less than 20%, as most patients present late and are unsuitable for curative, radical surgery. Gastric tumors are seen in the images below. Polypoid carcinoma of the body of the stomach. Infiltrating carcinoma involving the greater curve of the stomach. Adenocarcinomas account for approximately 95% of all malignant gastric neoplasms. The remaining 5% of tumors are lymphomas, leiomyosarcomas, carcinoids, or sarcomas. Gastric adenocarcinomas are divided into 2 types. Type 1 adenocarcinomas are intestinal tumors and have well-formed glandular structures. This form of gastric carcinoma is more likely to involve the distal stomach and occur in patients with atrophic gastritis (seen in the image below). It has a strong environmental association. A type 2 adenocarcinoma is a diffuse type with poorly cohesive cells, which tend to infiltrate the gastric wall. Tumors of this type may involve any part of the stomach, especially the cardia; they have a worse prognosis than type 1 tumors. *Tx indicates any T stage; Nx, any N stage. 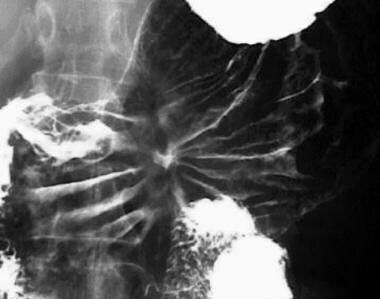 This section examines radiologic findings in early and advanced gastric carcinoma. 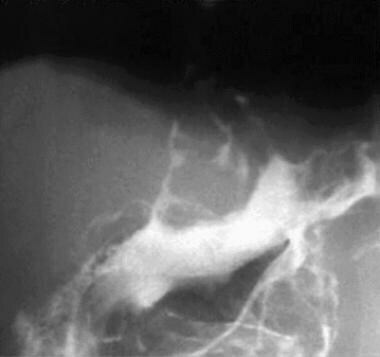 Gastric carcinomas are occasionally seen on plain abdominal radiographs as abnormalities in the gastric contour or as soft-tissue masses indenting the gastric contour. Rarely, mucin-producing carcinomas may show areas of punctate calcification. 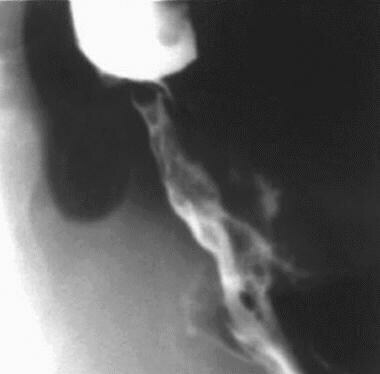 On barium studies, gastric carcinomas may be polypoidal, ulcerative, or infiltrating lesions. Polypoid carcinomas (an example of which appears below) are lobulated masses that protrude into the lumen. They may contain 1 or more areas of ulceration. With ulcerated carcinomas, an irregular crater is located in a rind of malignant tissue. Seen en face, tumor nodules may be in the adjacent mucosal folds; the mucosal folds that converge to the edge of the ulcer may be blunted, nodular, or clubbed from tumor infiltration. Seen in profile, these lesions are intraluminal, whereas benign ulcers project beyond the contour of the stomach. The radiating folds associated with a benign ulcer are regular and extend close to the ulcer margins (see the image below). Endoscopy and biopsy are generally required to confirm or rule out malignancy in most cases of gastric ulcers. Gastric ulcer with symmetrical, radiating mucosal folds. At histologic evaluation, no evidence of malignancy was observed. Scirrhous carcinomas typically cause irregular narrowing and rigidity of the stomach, giving rise to the typical linitis plastica, or "leather bottle," appearance (as seen in the image below). Although some are lobulated lesions in the fundus or body, others consist of thickened, irregular mucosal folds and nodularity without significant narrowing. 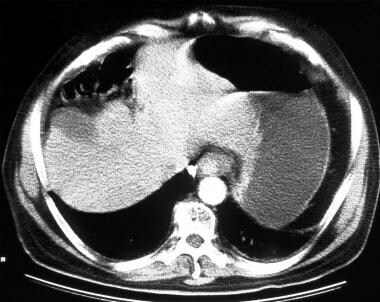 Carcinomas of the cardia are often missed during single-contrast examinations. In double-contrast studies, normal anatomic landmarks are obliterated and replaced by a plaquelike lesion with nodularity or ulceration. The distal esophagus is often involved. (See the images below). Extensive carcinoma involving the cardia and fundus. 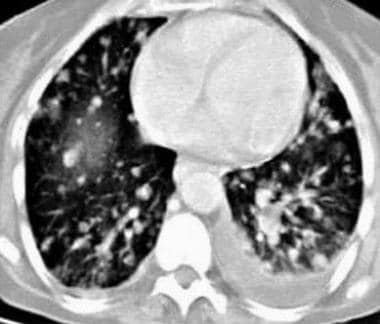 Carcinoma of the cardia with involvement of the distal esophagus. Submucosal spread of tumors may result in pseudoachalasia or secondary achalasia with tapered, beaklike narrowing of the distal esophagus and infiltration of the gastric cardia (demonstrated in the images below). Secondary or pseudoachalasia due to infiltrating carcinoma of the cardia. Note malignant infiltration of the cardia (same patient as in the previous image). As previously stated, single-contrast barium studies have an overall 75% sensitivity in the detection of gastric cancer, while double-contrast barium examinations have a 90-95% sensitivity in gastric cancer detection. Thus, the double-contrast studies have a sensitivity comparable to that of endoscopy. 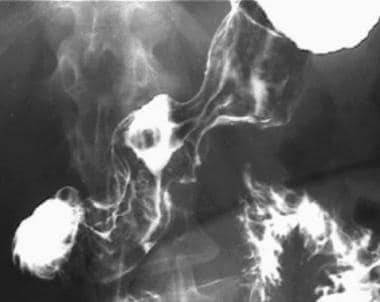 The appearance of gastric carcinomas on barium studies must be distinguished from the appearances of benign gastric ulcers and polyps, gastric lymphomas, and focal gastritis. Malignant stromal tumors may also cause confusion. Although linitis plastica is usually caused by gastric carcinoma, it can also be caused by metastatic breast cancer. In rare cases, radiation therapy, Crohn disease, tuberculosis, sarcoidosis, and syphilis may simulate gastric carcinoma, and primary esophageal adenocarcinoma may invade the stomach. Gastric varices and inadequate distension may mimic tumors of the gastric fundus. Detection of gastric carcinoma is improved by using thin-section sequences and helical or multidetector-row CT. 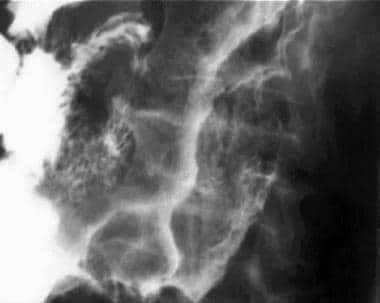 When thin collimation is used, near-isotropic imaging of the stomach is possible, allowing high-quality multiplanar reformation and 3-dimensional reconstruction of gastric images. An intravenous contrast medium is used, along with water or gas as a negative intraluminal agent (the results of which are seen in the image below). Prone views improve visualization of tumors of the cardia and distal stomach. 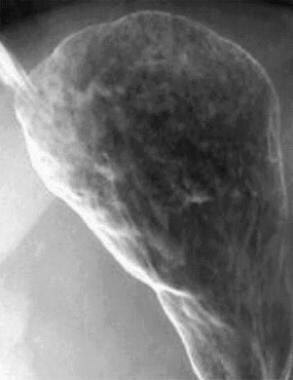 The stomach is distended by using water as a negative intraluminal contrast agent. Results of this examination are normal. Helical scanning allows for a biphasic technique. The early arterial phase is used to assess enhancement of the gastric wall; the later portal venous phase is used to assess the liver parenchyma for metastases. Carcinoma of the lesser curve. Note the focal mural thickening due to a tumor plaque. 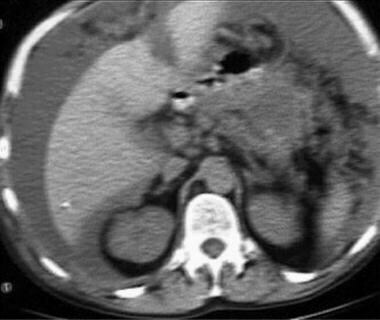 The depth of tumor invasion is not accurately assessed with CT.
Tumor invasion of the perigastric fat is seen as soft-tissue stranding. Tiny 4- to 8-mm nodules may be observed. These may coalesce into sheets of tumor in advanced cases. Direct extension of the tumor is relatively common. The pancreas is invaded via the lesser sac; the transverse colon, via the gastrocolic ligament; and the liver, via the gastrohepatic ligament. Longitudinal spread to the distal esophagus occurs in as many as 60% of patients with carcinoma of the cardia (see the images below). However, the duodenum is involved in only 5-20% of antral carcinomas. Carcinoma of the cardia. Note the liver metastasis. Tumor extension to the distal esophagus (same patient as in the previous image). Overall, the accuracy of determining the T-stage with CT is approximately 66%. Lymph node metastases occur in approximately 80% of patients with gastric cancer (see the images below). The frequency is related to the size and depth of the tumor; local perigastric nodes are involved first, followed by the regional (celiac, hepatic, left gastric, splenic) and distant (left supraclavicular and axillary) nodes. 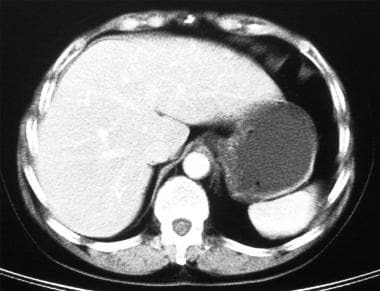 Carcinoma of the body of the stomach associated with regional lymphadenopathy and ascites. Enlarged porta hepatis lymph nodes, ascites, and omental involvement (same patient as in the previous image). 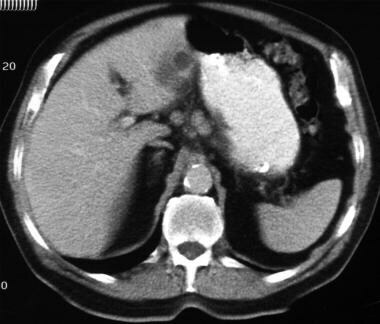 CT depicts 75% of nodes larger than 5 mm in diameter, but it does not depict tumor in normal-sized nodes. 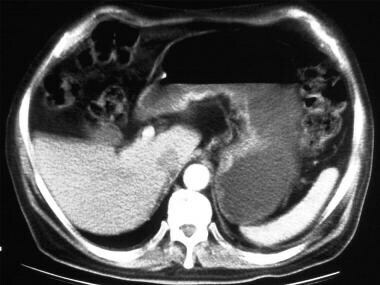 CT is not useful in distinguishing between enlarged nodes due to reactive changes and those due to tumor. The local nodes (N1) are located in the prepyloric region and in the gastrocolic and gastrohepatic ligaments. These nodes are removed by performing the standard gastrectomy procedure. The regional nodes (N2), located in the porta hepatis, hepatoduodenal ligament, and peripancreatic region, are not removed by the gastrectomy procedure; thus, their detection is more important. Because the portal vein drains the stomach, the liver is the most common site for hematogenous metastases (see the first image below). Less common sites are the lungs (see the second image below), adrenal glands, and kidneys. Bony and cerebral metastases are uncommon. Celiac-axis nodes measure 8-12 mm and are from carcinoma of the cardia. 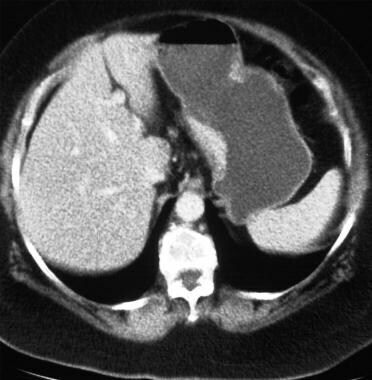 Note the irregular liver metastasis and adjacent rounded cyst. 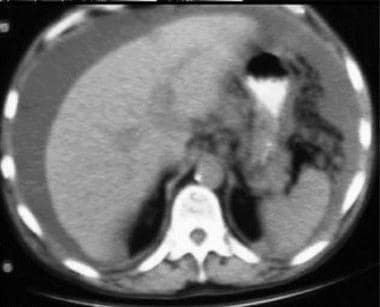 Pulmonary metastases and left pleural effusion from a gastric carcinoma. Intraperitoneal and omental metastases are common in advanced gastric cancer. They consist of nodules, localized fluid collections, and irregular thickening and stranding of the mesentery and omentum. Ascites and small-bowel obstruction may occur. Gastric carcinoma is the most common primary tumor to metastasize to the ovaries. 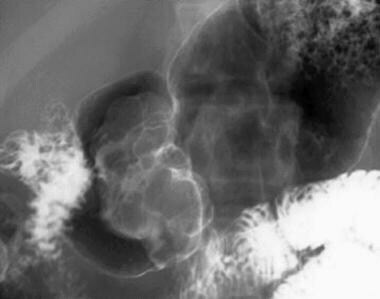 These ovarian metastases are usually bilateral and are known as Krukenberg tumors. CT scanning has several pitfalls. A pseudomass as a result of a normal gastroesophageal junction may be seen, underdistension of the stomach may simulate wall thickening, and T2 and T3 lesions may be difficult to distinguish. 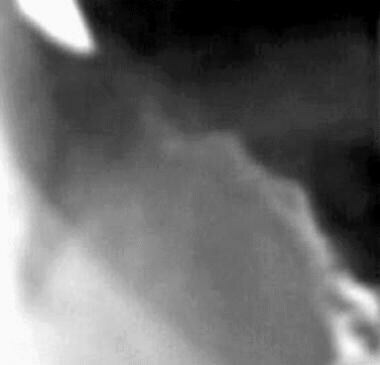 Moreover, loss of a fat plane between the gastric wall and the left lobe of the liver may be seen. Loss of a fat plane between the tumor and pancreas may be due to an inflammatory reaction. In cachectic patients, a loss of fat planes may simulate direct organ invasion. Small nodes may contain tumor, and large nodes may result from inflammatory causes. Perigastric nodes may not be observed if the stomach is not well distended. CT may fail to depict tiny omental and peritoneal deposits; small pelvic deposits may be overlooked as well. In T staging, the accuracy of MRI is 73%, compared with 67% for CT. In N staging, the accuracy of MRI is 55%, compared with 59% for CT.
MRI is limited by the presence of respiratory and peristaltic artifacts, the lack of suitable oral contrast media, and a higher cost than that of CT scanning. Gastric carcinomas are occasionally identified during US of the upper abdomen. EUS has improved the accuracy of local staging of gastric carcinomas. Its role is to assess the depth of local invasion and the presence or absence of perigastric nodes. Unlike CT and MRI, EUS can depict individual layers of the gastric wall, with a rotating high-frequency probe inserted via an endoscope. EUS is limited to an area 5 cm from the probe. 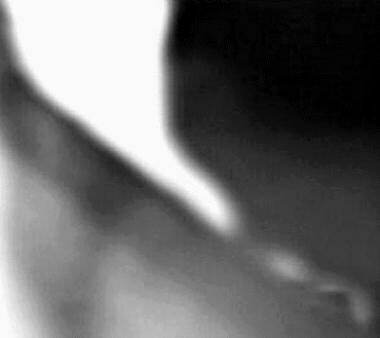 It cannot be used to assess distant metastases or nodes more than 5 cm away from the probe. A gastric tumor is demonstrated as a hypoechoic mass with varying mural invasion. Its depth may be overestimated because of the inflammatory response around the tumor, or it may be underestimated because of microscopic spread. With T1 tumors, wall thickening is limited to the mucosa and submucosa. Regarding N staging, involved nodes are rounder and more hypoechoic than normal nodes. In the detection of liver metastases, sensitivities as high as 85% have been reported. Overstaging is due to the peritumoral inflammatory response. In T staging, EUS is 89-92% accurate, and CT is 43-65% accurate; however, the accuracy of CT increases with the use of the helical biphasic technique. In N staging, EUS is 60-85% accurate, and CT is 48-70% accurate. Inflammation may cause enlarged nodes. EUS has a high specificity (90%) but low sensitivity (53-80%) because it has a range of 5 cm from the gastric wall for nodes of normal size; thus, it does not permit assessment of the full extent of lymphadenopathy. Involved small nodes are not detected. Intraoperative US and laparoscopy have an accuracy of 81% in T staging and an accuracy of 93% in N staging; however, the necessary equipment and expertise are not widely available. Indium-111 (111 In) – labeled monoclonal antibody has been used for intraoperative imaging to detect nodes, with an accuracy of 72%. FDG-PET may be useful in evaluating patients with recurrent gastric cancer; findings can help to localize the disease when CT findings are not diagnostic. Imaging evaluation with PET may also impact the clinical management of patients with recurrent gastric cancer. Park JM, Jang YJ, Kim JH, Park SS, Park SH, Kim SJ, et al. Gastric cancer histology: clinicopathologic characteristics and prognostic value. J Surg Oncol. 2008 Dec 1. 98(7):520-5. [Medline]. Ingram M, Arregui ME. Endoscopic ultrasonography. Surg Clin North Am. 2004 Aug. 84(4):1035-59, vi. [Medline]. Ahn HS, Kim SH, Kodera Y, Yang HK. Gastric cancer staging with radiologic imaging modalities and UICC staging system. Dig Surg. 2013. 30(2):142-9. [Medline]. Hallinan JT, Venkatesh SK. Gastric carcinoma: imaging diagnosis, staging and assessment of treatment response. Cancer Imaging. 2013 May 30. 13:212-27. [Medline]. Nakamura M, Nishikawa J, Goto A, Nishimura J, Hashimoto S, Okamoto T, et al. Usefulness of ultraslim endoscopy with flexible spectral imaging color enhancement for detection of gastric neoplasm: a preliminary study. J Gastrointest Cancer. 2013 Sep. 44(3):325-8. [Medline]. Pan Z, Pang L, Ding B, Yan C, Zhang H, Du L, et al. Gastric cancer staging with dual energy spectral CT imaging. PLoS One. 2013. 8(2):e53651. [Medline]. [Full Text]. Ge MY, Yin HB, Wan KM, Ge JF, Jin H. Computed tomography of gastrohepatic ligament involvement by gastric carcinoma. Abdom Imaging. 2013 Aug. 38(4):697-704. [Medline]. Chin BB, Chang PP. Gastrointestinal malignancies evaluated with (18)F-fluoro-2-deoxyglucose positron emission tomography. Best Pract Res Clin Gastroenterol. 2006 Feb. 20(1):3-21. Kim YH, Lee KH, Park SH, Kim HH, Hahn S, Park DJ, et al. Staging of T3 and T4 Gastric Carcinoma with Multidetector CT: Added Value of Multiplanar Reformations for Prediction of Adjacent Organ Invasion. Radiology. 2008 Dec 18. [Medline]. Fujiwara M, Kodera Y, Satake H, Misawa K, Miura S, Nakayama G, et al. Navigation for laparoscopic gastrectomy with 3-dimensional computed tomography (3D-CT). Hepatogastroenterology. 2008 Jul-Aug. 55(85):1201-5. [Medline]. Ba-Ssalamah A, Prokop M, Uffmann M, et al. Dedicated multidetector CT of the stomach: spectrum of diseases. Radiographics. 2003 May-Jun. 23(3):625-44. [Medline]. Lee JH, Jeong YK, Kim DH. Two-phase helical CT for detection of early gastric carcinoma: importance of the mucosal phase for analysis of the abnormal mucosal layer. J Comput Assist Tomogr. 2000 Sep-Oct. 24(5):777-82. [Medline]. Botet JF, Lightdale CJ, Zauber AG. Preoperative staging of gastric cancer: comparison of endoscopic US and dynamic CT. Radiology. 1991 Nov. 181(2):426-32. [Medline]. Suzuki H, Hasegawa Y, Terada A, Ogawa T, Hyodo I, Suzuki M, et al. Limitations of FDG-PET and FDG-PET with computed tomography for detecting synchronous cancer in pharyngeal cancer. Arch Otolaryngol Head Neck Surg. 2008 Nov. 134(11):1191-5. [Medline]. Yamada I, Hikishima K, Miyasaka N, Kato K, Ito E, Kojima K, et al. q-space MR imaging of gastric carcinoma ex vivo: Correlation with histopathologic findings. Magn Reson Med. 2015 Aug 29. [Medline]. Kim HW, Won KS, Song BI, Kang YN. Correlation of Primary Tumor FDG Uptake with Histopathologic Features of Advanced Gastric Cancer. Nucl Med Mol Imaging. 2015 Jun. 49 (2):135-42. [Medline]. Altini C, Niccoli Asabella A, Di Palo A, Fanelli M, Ferrari C, Moschetta M, et al. 18F-FDG PET/CT role in staging of gastric carcinomas: comparison with conventional contrast enhancement computed tomography. Medicine (Baltimore). 2015 May. 94 (20):e864. [Medline]. Yu T, Wang X, Zhao Z, Liu F, Liu X, Zhao Y, et al. Prediction of T stage in gastric carcinoma by enhanced CT and oral contrast-enhanced ultrasonography. World J Surg Oncol. 2015 May 19. 13:184. [Medline]. Carcinoma of the antrum. Note the circumferential mural thickening. Extensive mesenteric, omental, and peritoneal metastases (same patient as in the 2 previous images).